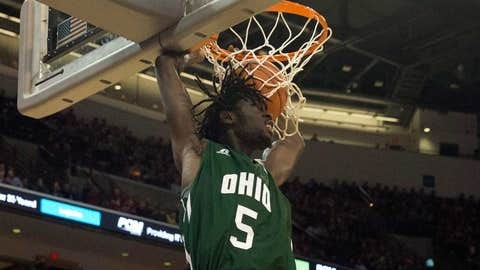 Ohio University forward Maurice Ndour led the Bobcats with 16 points in Wednesday night's loss to Massachusetts. ATHENS, Ohio (AP) — Maxie Esho had 16 points and 10 rebounds, Chaz Williams had 11 points and 11 assists and No. 22 Massachusetts remained undefeated with an 83-71 victory over Ohio on Wednesday night. Sampson Carter added 14 points, including eight straight in the second half, for the Minutemen (10-0), who shot 60.4 percent from the field (32 of 53) and led by as many as 19 points. Maurice Ndour scored 16 points for Ohio (7-3), which made just five of 24 attempts from 3-point range (20.8 percent). Nick Kellogg added 12 points for the Bobcats, who were playing their first home game against a ranked opponent since 1997. Carter made all three of his 3-point attempts as the Minutemen went 9 of 14 from beyond the arc (64.3 percent).